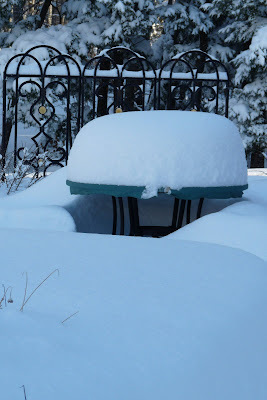 Our picnic table after 18" of snow earlier in January. Pretty, yes, but it is getting a bit debilitating. 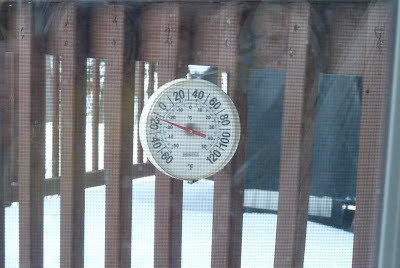 Plus, I think that this was the storm that our snowblower was in for servicing! Over the last week we had this killer icicle growing on the corner of our house. I streached from the 2nd story roof down nearly to the 1st story window - around 10 feet long. I didn't bother it, but instructed my kids to stay away. Yesterday, my hubby decided he'd knock it down. The chunk he is holding is about 35lb, and is at least a foot across. Monster icicle! I wish I had a cell phone camera, because I have passed other great icicle houses this week. 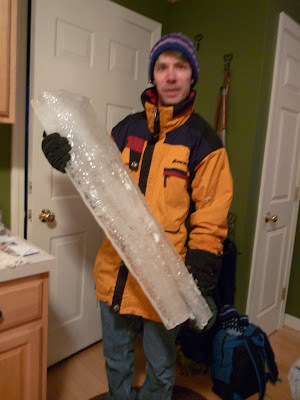 One had roof to ground icicles (8') all across the front of the house! Here's our little lost robin. He/She is SOOOO confused. This picture was taken in the middle of this week's 10" snow storm. 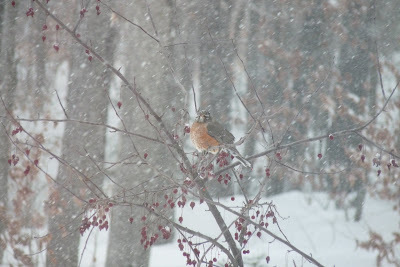 Little bird is sitting in our crab apple tree - probably it's only source of winter food. So, I thought I'd give robin a little food the next day. My mother-in-law gave us a fruitcake/bread that even the kids would not eat so I thought, naturally, of the birds. 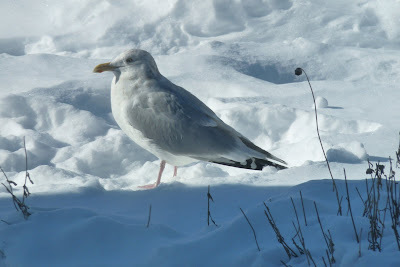 The poor robin didn't get any because as soon as I tossed the bread into the yard, the darn seagulls decended! And I am at least 12 miles from the coast! And the worst of it is that I discovered water on my ceiling and wall last night - a roof ice dam that is leaking snow melt into the house. It just ticks me off to no end - means that now a part of my bedroom ceiling needs repair and painting, and the paint was a custom mix (aka by me) and has a very nice simple stencil near the roof. Very frustrating, considering our roof is highly pitched too. Enough on winter... We have over 2' of snow on the ground and there's probably no chance that Mr. Puxatawny is going to see his shadow on Monday. 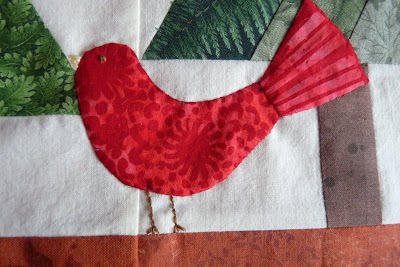 It'll be April or May for us - I have been sewing and will show my birthday block swap blocks this week. I als made my 1st take on my center block for the next round of the SFRR3. It is very hard designing and sewing for yourself as a client, I have learned...much harder than making a block for someone else! And on Thursday, when I had that need for speed, I decided to whip up a 30 6" scrap blocks for another Linus top. 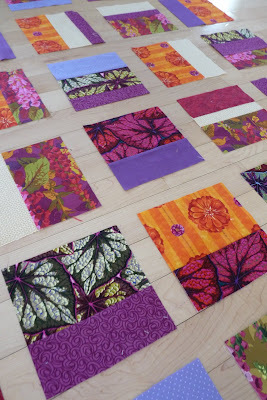 These use some of my Kaffee Fasset red and purple foxglove and begonia leave fabric squares. I have had these for a while, and just didn't know what I was going to use them on. They are bright and bold. 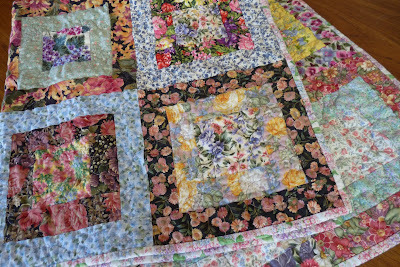 I have finished one of the quilt tops made with squares donated by Kate. I had been spending all of my quilty time hand quilting, but have been having a thread breakdown, and needed some speed! 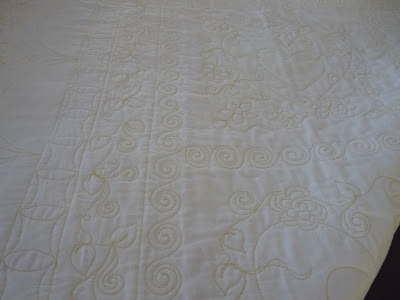 You see, I ran out of my ivory hand quilting thread last weekend. I popped into Joann's and got another. I got it home and it just seemed too thin, like it was really a machine quilt thread. The next day, I exchanged it for a Gutterman's which was in a hand-quilting thread display. After getting home, and comparing it to that which I had been using, it too was thin. UGH!...I then did what I should have done first...go here. I have thread on the way, I hope. So in the meantime, I decided to finish a Linus quilt for donation, and work on my 3 birthday block swap blocks (awaiting Feb 1 for showing). 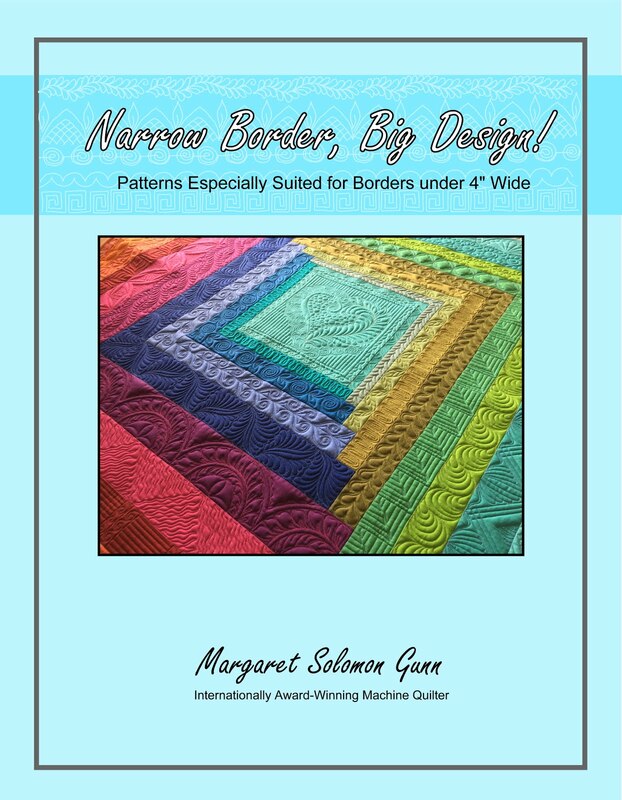 It's just a simple, large meander quilting. Except for a couple of the red batik squares bleeding during washing, it looks really good. I tried my hand at a machine sewn binding. 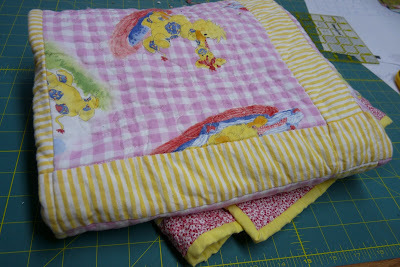 I make so many Linus quilts that I am constantly seeking a way to expedite the slower parts (ie, binding). But I typically have refused to do machined bindings as I think they usually look crappy. This time, I think I am onto something. I first machined it down very close to the edge of the binding. After this part, it did look pretty good. The trick was the busy print binding did masque any errors well. I then chose to do a blanket stitch over this. I like the look, and it will weat well. Now, to find a way to do this all in one step. The entire binding took about a bobbin and a half of thread, and about 45 minutes to do. I thought that the backing was appropriate. It's a print with letters and postal stamps - very worldly...a nice touch since the 12 squares of this quilt came from all over the world! Anybody interested in an Awesome Round Robin? 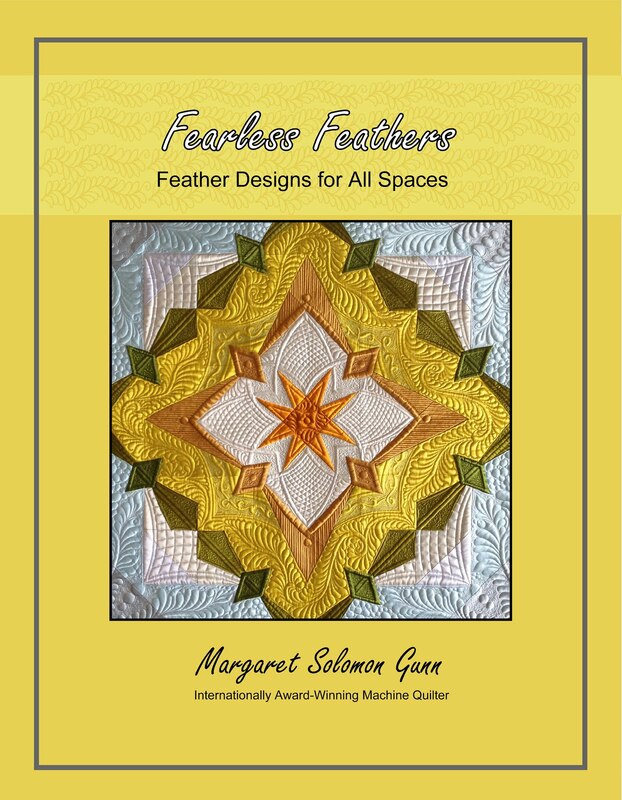 I have taken 16 quilters by invitation and have another 10 spots available. ...But not for a shortage of sewing actually accomplished. Last weekend I sandwiched and basted this quilt top. It took about 6 hours just to baste it. I ought to show you the raw fingers I have. One actually has a hole in it! 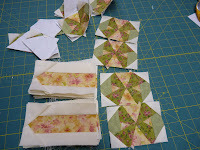 Anyhow, I have been hand quilting away for a week solid. Ond day last week I just had to have a break, and I went to my sewing hole to use the machine. I cannot show those blocks until February though. So, in a week's time I have done much of the quilting of this "top" (the part on the bed...39" x 72") - 14 of the 15 dress blocks to be exact. 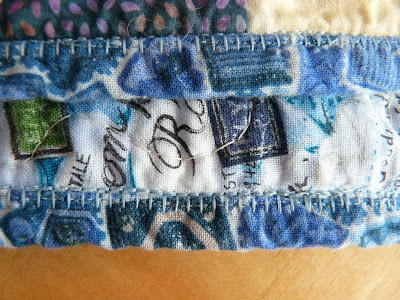 I am ditch stitching each dress, and then again 3 more times to border the block borders. 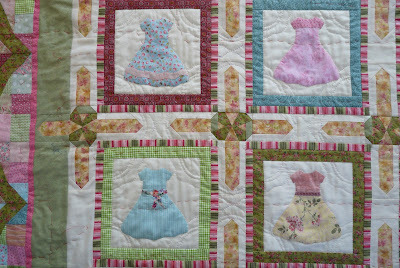 Then there is a floral pattern quilted into the ivory part of the dress blocks and the sashings. I need to find a better way to photograph them, because flat on my hallway floor is clearly not working. I am planning on avoiding quilting the bows becasue they are all seam, and putting a small rose colored button in the center. and here is the back. Not to boring, not too interesting. A couple weeks ago, I won a 12" square giveaway that Kate was hosting. She had received the blocks in a swap, and decided not to do anything with them. I got 25 in all, but since one was actually stiched with an error, I opted to use just 24, and make 2 smaller quilt tops for Project Linus. Though not entirely obvious from the photo, they are done from batiks. I separated them into 12 that looked more feminine (ie, pinks & yellows), and 12 that better suit a boy. Girly ones were sashed with a bold purple print, and the boy with a blue. 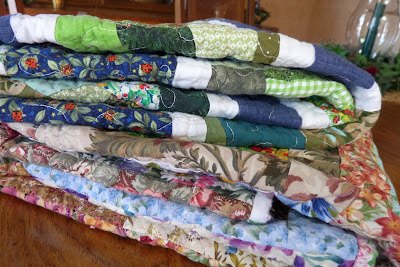 I will also bind the quilts with these fabrics. 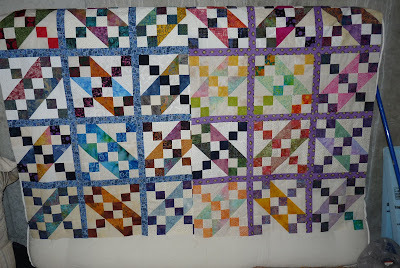 I am undecided on an outer border. The quilts are currently 40" x 54", which is a good size for a child, and works for me since my roll of batting is 45" wide! Thanks Kate!! Here's another set of blocks I got in a swap. This is all but 2 of the 8" New York Beauty blocks I got from the birthday block swap. I have all but given up hope on getting the other two (which the quilt top is obviously missing!!). It's too bad when swappers don't live up to their end of an obligation, especially after receiving one's own month of blocks. These blocks run the complete gamut. Some need a little repairing - some stitches came lose in transit. One had to have some picking out because I thought that it ought to have a few points showing. And one I am not yet sure what to do with, as there is a huge (over 0.5") chunk missing because it somehow came out out of square. The color combination is very hot. I like that. I can not say I totally enjoyed making the 2 of these that I did, or that I look forward to the prospect of making 2 more! But it's interesting...Maybe I will ditch my 2 least favorite and make the quilt smaller :-) As for the arrangement, I have no idea how I will place them. Despite the seemingly critial critique here, the gals that made the blocks did a fantastic job. Thank you- Kate, Helen, Amy, Terri, Julie, Michele, and Anne (and 2 more who's names are just escaping me tonight). 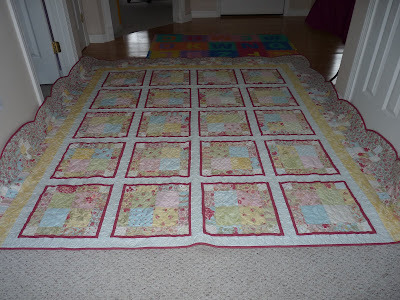 After about 20 hours of cutting, piecing (picking out), designing and sewing, Sophie's quilt flimsy is nearly complete. I am toying with adding applique flowers along the top of the swag (in the sage green area), but I am not sold on this just yet. The area with her name is designed to go over the pillow when the bed is made (at what age will a kid actually make the bed??). I changed my plan and added that bright pink border before the swag. It coordinates wonderfully with the Lakehouse stripe border around the dress blocks (which I am tentatively planning for the binding too). 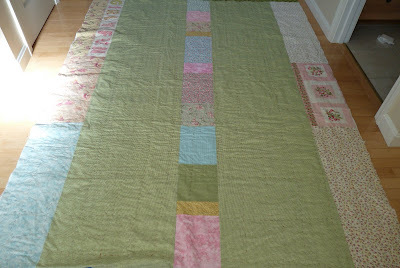 Plus, there is a rug in Sophie's bedroom that has sage and pink stripes and looks very similar to how I did the quilt. I hope to get a couple pictures tomorrow of it in the room - It looks absolutely fantastic!! Within a matter of a couple days, my nearly completed (I say "nearly" because it still has some finishing applique to do) Little Dresses quilt should be finished. It needs the last 2 borders, but I discovered that one of the fabrics (a pink) had not been washed yet. Rather than chance that the hot pink would bleed all over the ivory Egyptian cotton, I decided to halt production for the day. So what has 48 3"x2.375" blocks, 96 2.375"x2.375" squares, 64 2.75" squares, 64 2.375" x 3" rectangles, and 32 rather odd shaped trapezoids?? 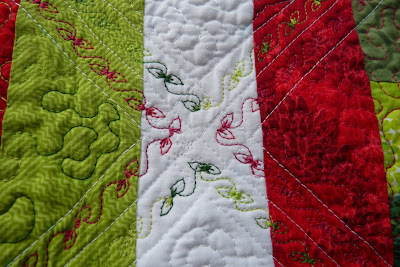 The last border going on my quilt. There are easier ways to make scrappy swagged border, but that was my approach. Hold on a day or two and I will post completed pictures! And oddly, making the last 10 paper pieced little bows went off well (and I have about a postage stamp of that green and yellow left!). 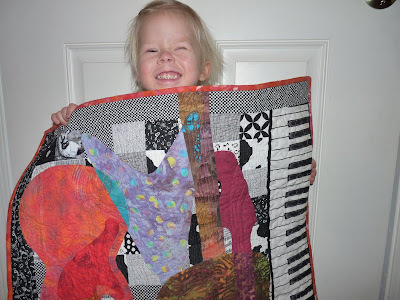 While I am still assembling border pieces for my Little Dresses quilt, and don't have much concrete to post on, I thought I'd show the 3rd Linus quilt for 2009. It was completed and washed last week. 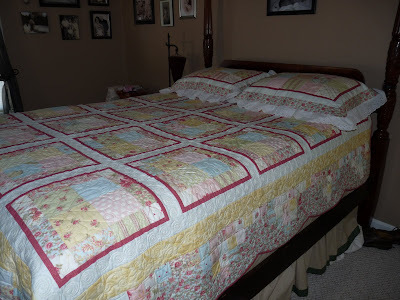 Here is the finished queen sized bed quilt made from Moda's Simplicity charm squares. I gave this to my in-laws for Christmas. I can't say with certainty that she/they love it, but at least I feel good about giving something that is nice. I gave it a test-run on my bed to see how it fit. My bed is high-posted, so it looks as though the quilt is not long enough on the sides. On a normal bed, it is plenty long. The bobbin thread is a pale yellow. The quilting shows up very nicely from the back. Gotta say it, I hate all those stupid swirls in the sashings. i had no idea there would be so many of them. 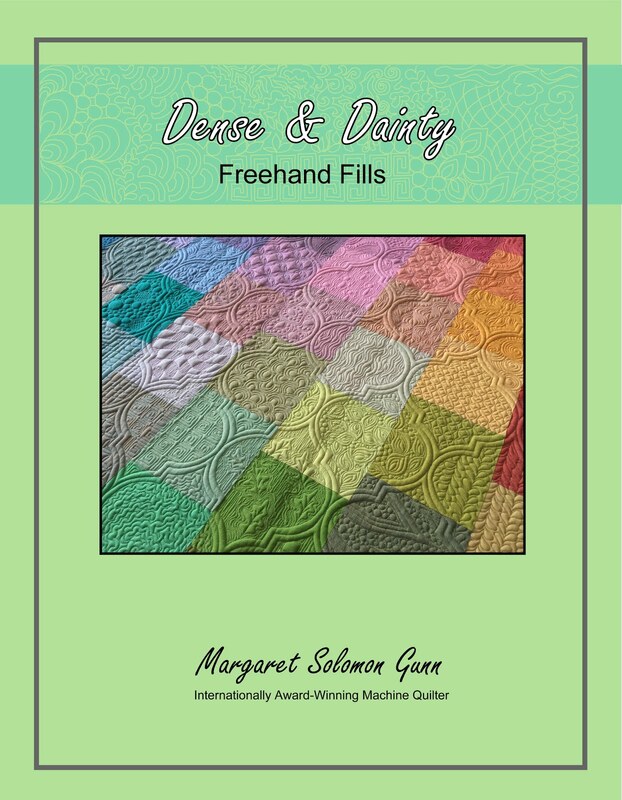 It is just another difficulty of machine quilting. 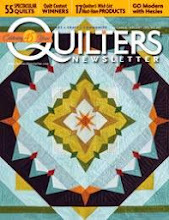 If I used my local quilter, I could preview what she does. If I use another one somewhere else, I just kind of have to go with her judgement. I also wish that the rose boxes had been outline stitched, but she didn't really want to do this without adding more cost. 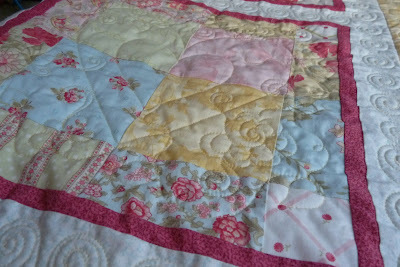 I can't really complain, the quilting looks fantastic. 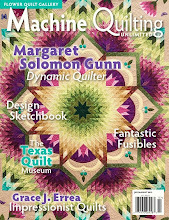 The machine quilting was done by Carla Riggs, mother of Ginger (aka Paisley & Polkadots). 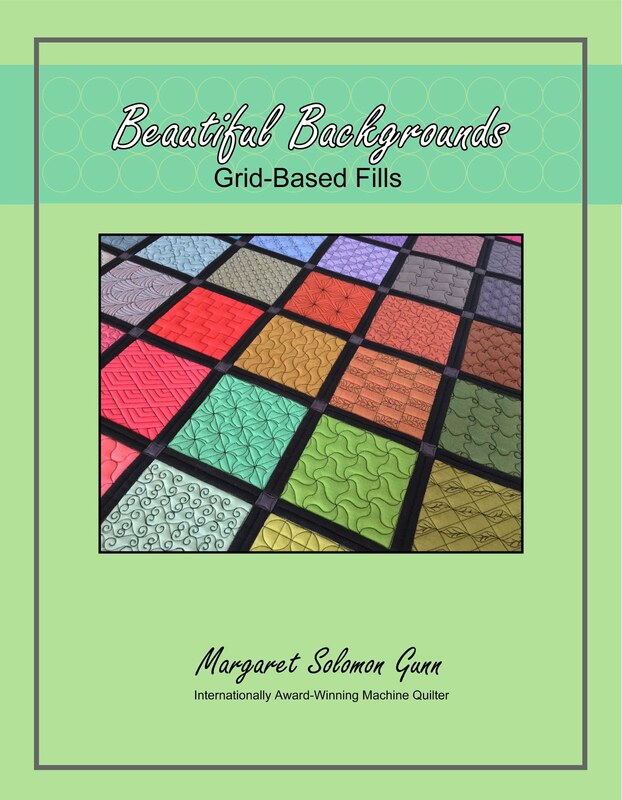 I was somewhat disallusioned with the lack of creativity of the machine quilter I have used that is local to me, so Ginger recommended her mother. 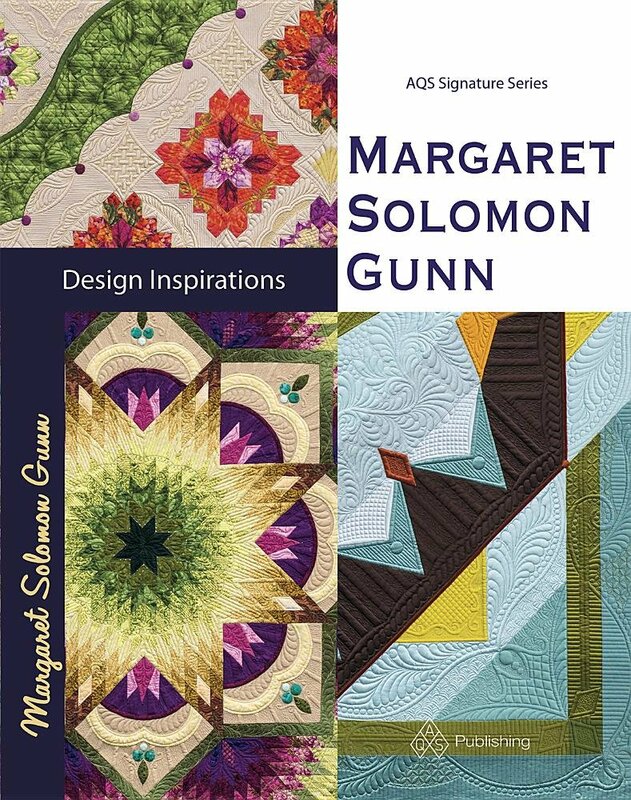 She's a blessing, as she also recommended the Amish quilters that hand quilted my mother's quilt. 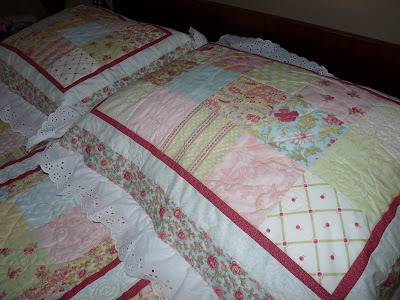 After receiving the finished quilt on December 1st, I decided I'd make coordinating pillow shams. These were fairly simple (after ordering another charm pack! 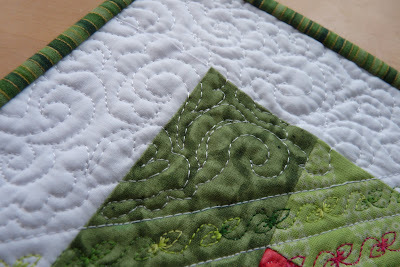 ), and I got to practice my machine quilting. I think that what I did matched the quilt really well. left: she (can't remember who w/o pulling paperwork) wanted a traditional style block in CW prints. It's 9.5" square. Thanks Amy for loaning me the reds!! These were definitely not my favorite blocks to make, and that is why I actually waited until January to do them (unlike the fall's blocks that were all done ahead!). This one is for Helen in the UK. It's the group 4 (more advanced) offering. 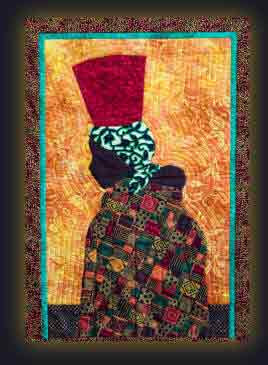 She requested any size color, but with Africal appeal and applique. I found the picture below on the internet and proceeded to mimic it. Not bad, eh?! 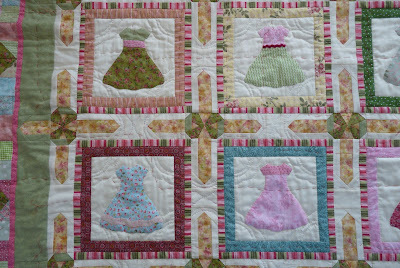 I figure Helen can use her quilting to help delineate the creases in the lady's gown around her neck and the baby on her back. It too needs some size trimming, but is essentially done. ...as the saying goes. Leave it to me to decide I want a Christmas table runner on December 30! Anyhow, I saw this one and thought it looked too simple to pass up. 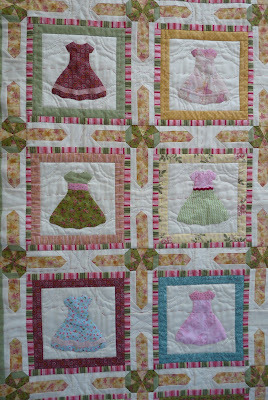 Only, she did a simpler quilting scheme, which just so happens to lay flat! So often I am left at the end of a project, scratching my head, asking myself "what was I thinking?"! I just thought that a large all-over stipple was too boring. Go figure! I did a stipple on the inner diamonds (on colored part of squares), used a walking stitch white to outline the diamonds, and then did a swirly pattern in white rayon on the white border. My walking foot is starting to crap out on my, which makes me a tad irate. My regular foot leaves fewer puckers than the walker did!! Because the binding has a touch of gold, I tried to do this decorative leaf stitch in the metallic gold thread. It looked AWESOME!! Only problem is that the stinking thread broke too often. I had to rip it all out and opted to redo it in red and greens. The decorative stitches do add a nice touch. Hopefully washing and setting it on table will help it to lay flat (or perhaps it will just make the red bleed onto the white...!). In keeping with my new year's resolution, I have completed these two Linus tops. 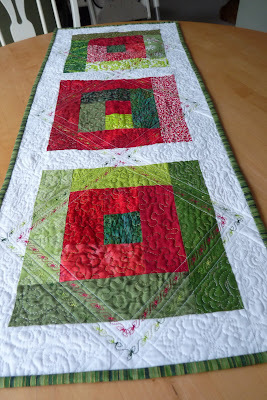 In reality, I wanted to do a Christmas table runner, and did not want the guilt of having not completed other things. 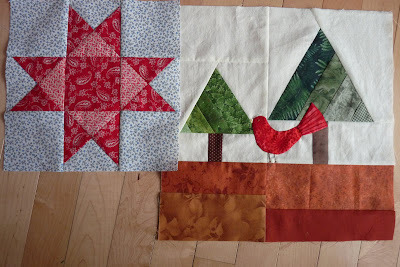 I know, a day (week) late and a dollar short for a Christmas quilt. But then...I saw a runner I loved, and wanted to make it before I forgot (or before next year!). 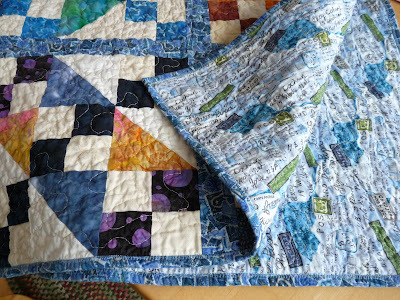 The quilts are meandered and free quilted. I finished the binding on the second just last night. Both are about 40"x50". Backing materials (though maybe not my absolute most favorite) came from donated one yard pieces I got at a Linus event last fall. I have a box with at least 30 yards of 1-yd sections, several in some patterns too which is perfect for backings. I used two yards for backing and binding. This morning, I washed them both. 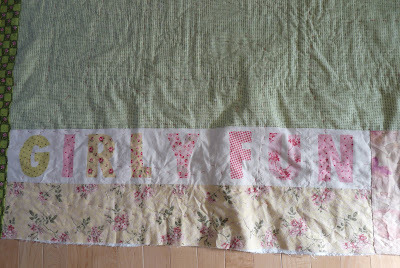 Though I am not a huge fan of that washed & crinkled look of a quilt, I did it anyhow in hopes of it masking a few little quilting bloopers. As expected, I couldn't even find them! I love this one...all made from about 50 floral materials and backed/bound in a pretty pink and purple hydrangae fabric. Hopefully, some little girl will love it too. This (as best I can recollect) was started in the fall of 2006. I worked on it last year some, but it was a bit discouraging as I felt I was botching it with my poor machine quilting skills. It was put aside, and I fully thought I might pick out lots of stitches before completing. 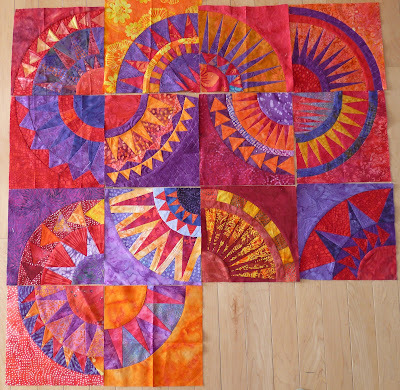 I have done a lot since then to improve my quilting; too bad that is not reflected here. 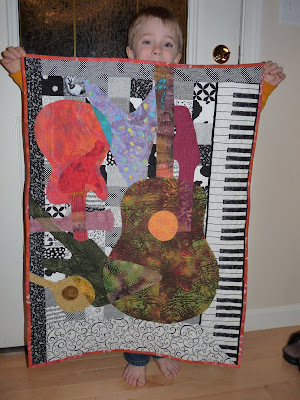 Yesterday, my oldest saw what I am making for my black & white challenge and was so delighted (he thought it was his/the guitar quilt). I thought, what better way to bring in the new year than to actually finish it. It needed a couple hours of quilting and the binding. The machine quilting has places that I'd never keep if it were for anything other than his joy and amusement. 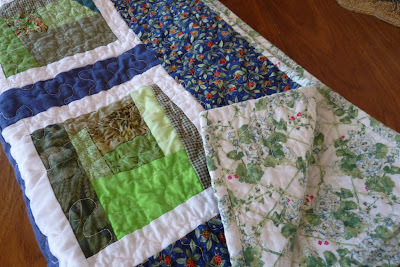 It feels good to have it out of the "incomplete quilts pile". Hayden is pleased too. His sister felt she was being left out by not having her picture taken with the quilt too. Silly girl! Don't zoom too closely at the sewing, please!! 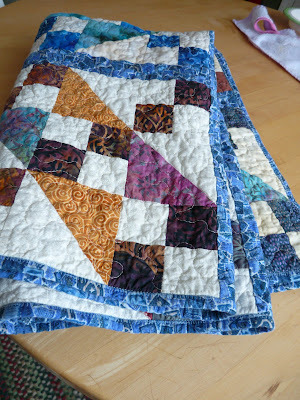 The design is great, but I failed the effort with my quilting. I don't bother with resolutions, as I lack the ability to keep them. I have no need for smoking cessation, dieting, etc so any resolution I may make might entail exercising more, being more tollerant with my kids, cooking more creatively, etc...And these are just BORING!!! stop buying anything but apparel fabric (dresses for daughter) and thread (no more quilt fabric) until April - yes, three months cold turkey! !